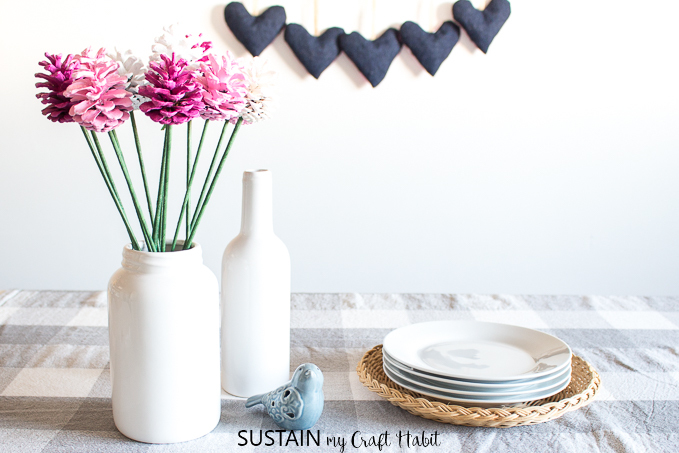 I would love to keep fresh cut flowers in my home every day if I could, who wouldn’t? But since fresh cut flowers are not all that possible, I think I may have found an alternative with these colorful pine cone roses. Hello dear friends! We’re so excited to be joining over two dozen bloggers from across Canada to bring you 30 sweet ideas to make, bake and create for Valentine’s Day. 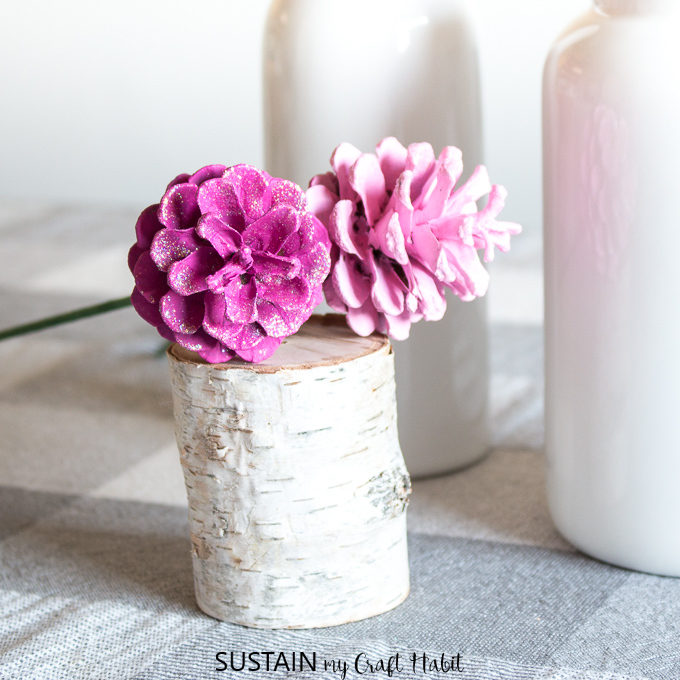 Thank you so much to Jo-Anna from A Pretty Life in the Suburbs blog for coordinating this inspiring blog hop. Be sure to check out all the amazing projects at the end of this post. 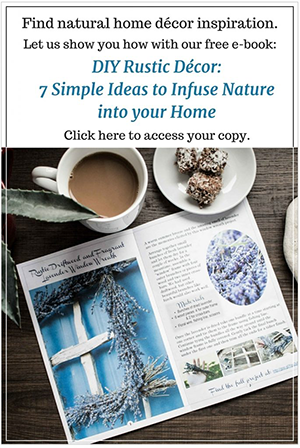 For our contribution to this blog hop, we wanted to show you how to make pine cone roses that you can arrange together in a bouquet or leave them on their own as single delicate rose. 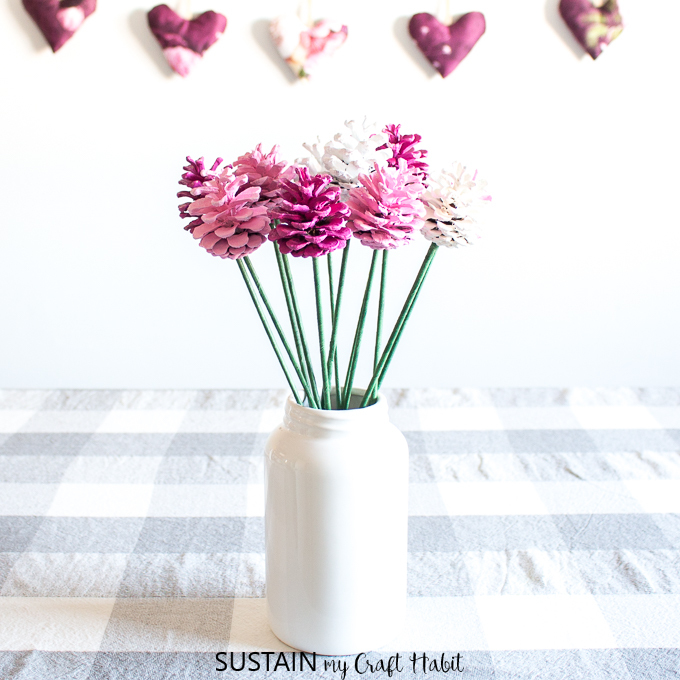 And since these pine cone roses will never wilt , they can be reused as decorations throughout the year, such as for Valentine’s Day, Mother’s Day or some other special occasion, like a bridal shower or wedding. 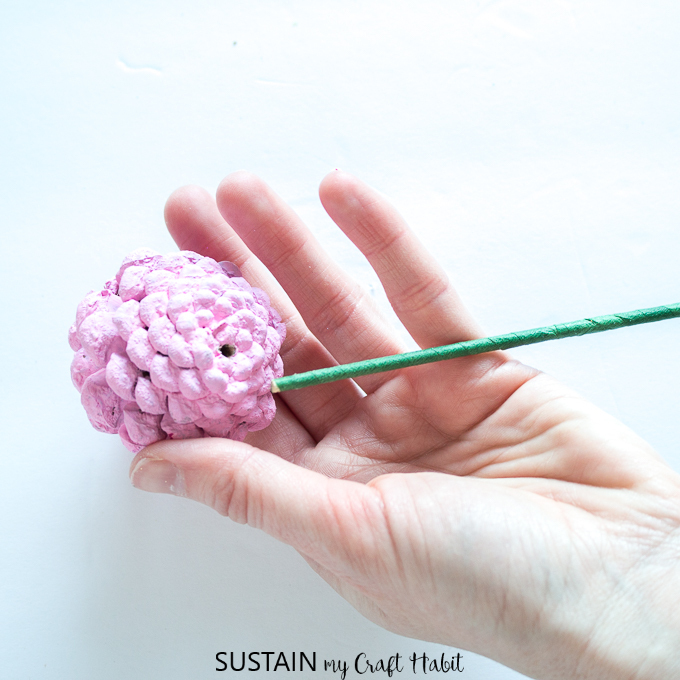 These pine cone roses are one of those really fun nature crafts that you can do on your own as part of girls crafting night. And if you’re looking for more creative crafting ideas, check out our top picks of craft kits for adults. Disclosures: We have not received any compensation for this post. However, we have (and continue to) receive products from DecoArt. 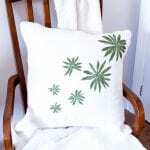 Also, this post continues affiliate links for your shopping convenience. You can find our full disclosure policy here. 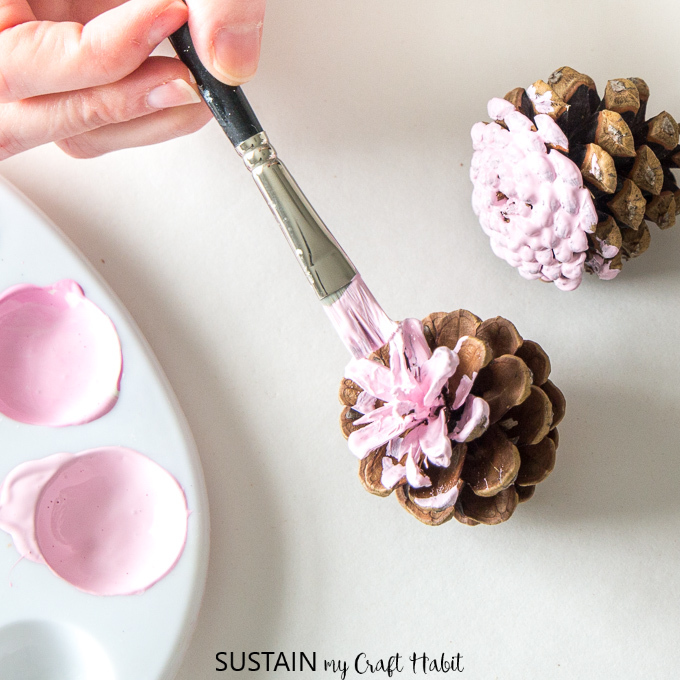 Using a small, flat tip paint brush, paint each pine cone in the colour of your choice. Put aside to dry between coats and apply as needed to achieve desired coverage. 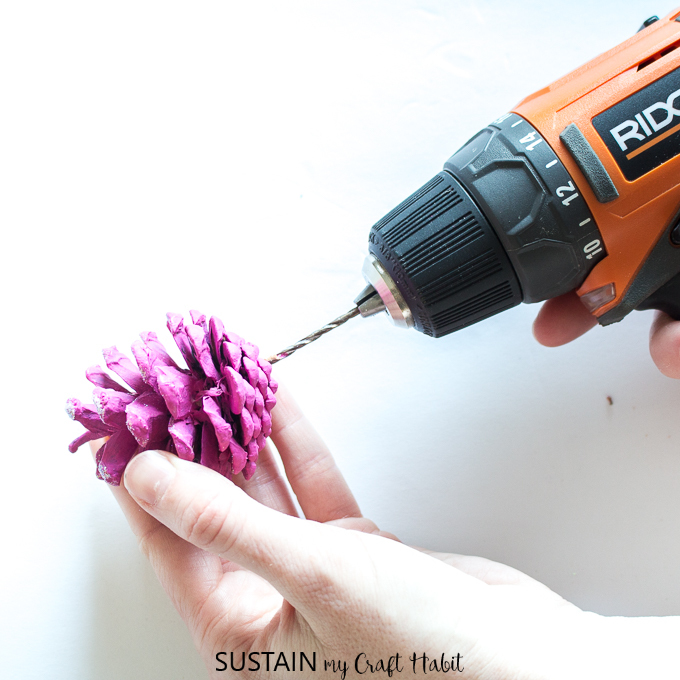 Once dry, drill a small hole about ¼” deep into the bottom of the pine cone using a small size drill bit (the same size as the diameter of the wooden skewer). 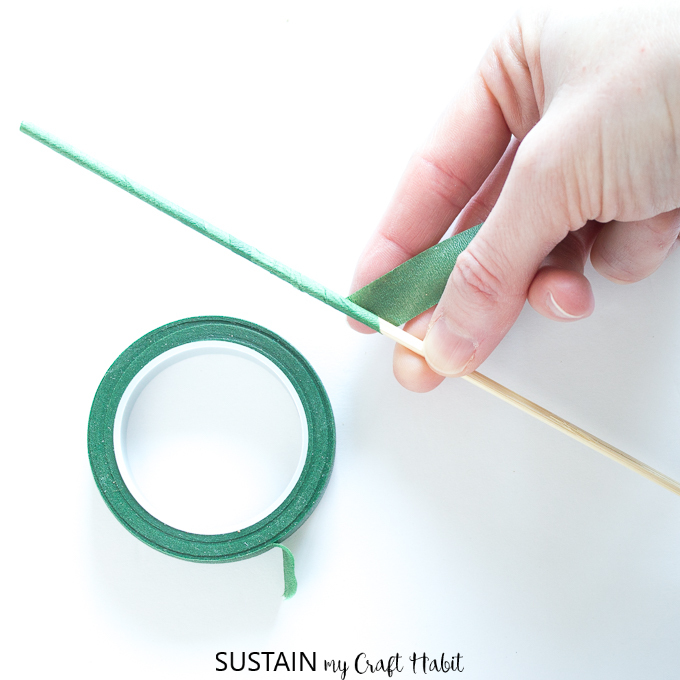 Wrap the wooden skewer with green floral tape starting at one end and finishing at the other. Insert one end of the wrapped skewer into the drilled pine cone. Add glue if necessary to hold together. And who doesn’t love a little glitter? 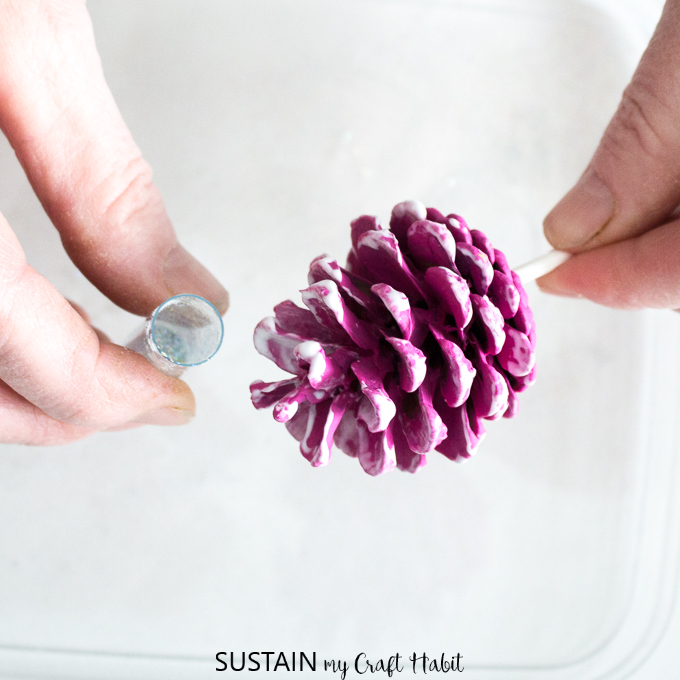 You can also add some fine translucent glitter to the painted pine cones by applying clear drying craft glue to pine cone tips and then pouring glitter over top. 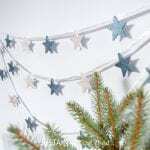 Shake off the excess glitter and set aside until dry. 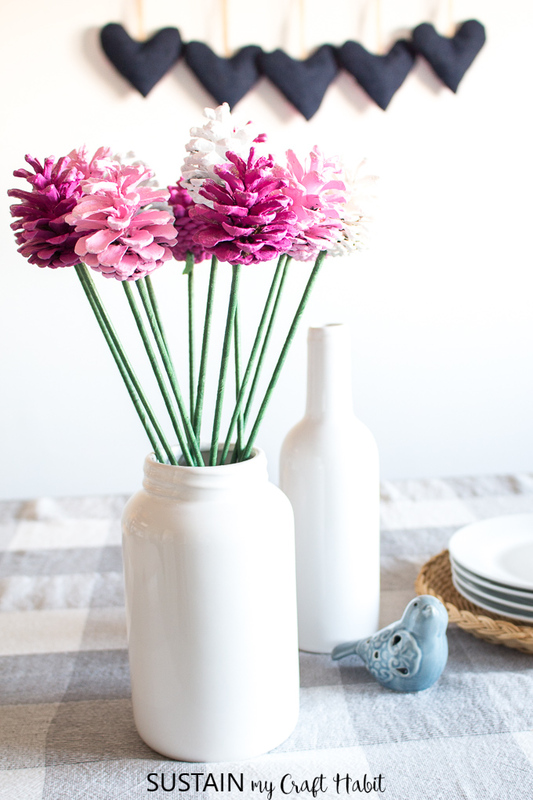 Arrange the pine cone roses inside a vase for a beautiful alternative floral bouquet. 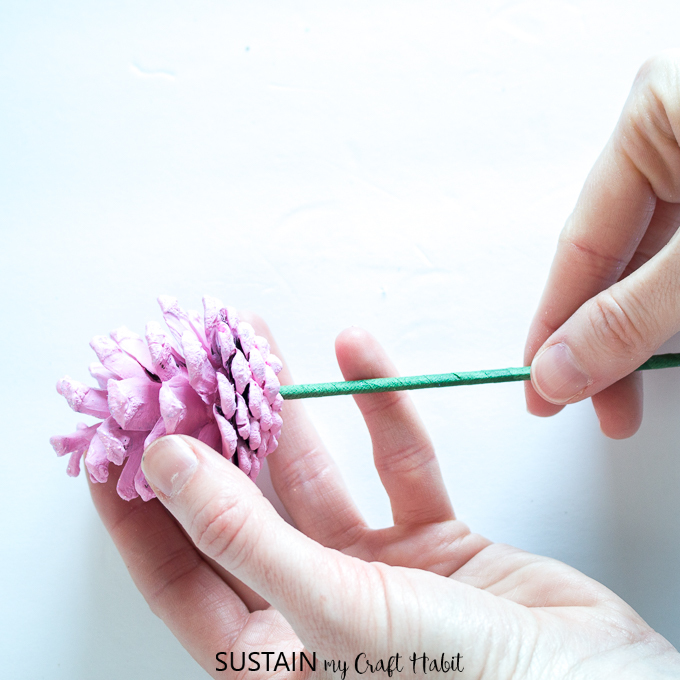 We hope you’ve enjoyed this tutorial on how to make pine cone roses. 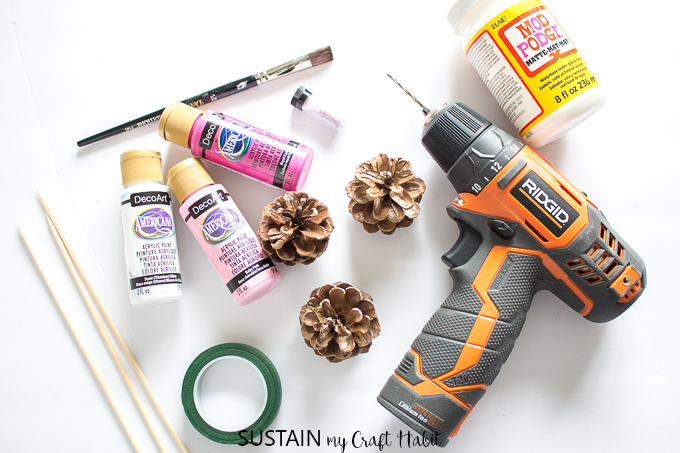 We definitely have a thing for crafting with pine cones, as you can probably tell from our many pine cone projects, such as our rustic pine cone wall hanging and our easy DIY burlap wreath. Pine cone roses!!! What a great and cute idea!! Love it! Pinned! What a lovely idea. 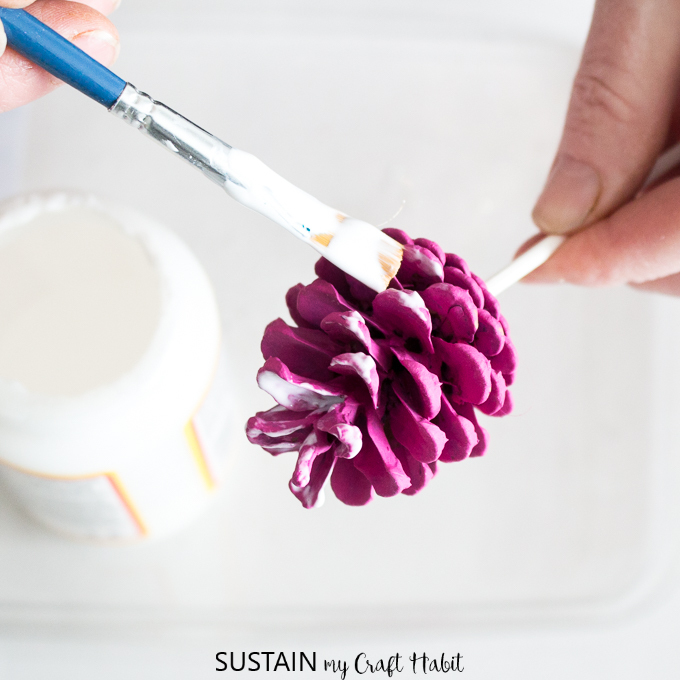 We love crafting with pine cones. This is so SMART!!! Valentine’s Day is at a weird time of the year where (at least in Ottawa), it’s still frigid and snow covered! Love this!! Same here, that’s why it’s nice to bring in some color this time of year! What a great and simple idea! 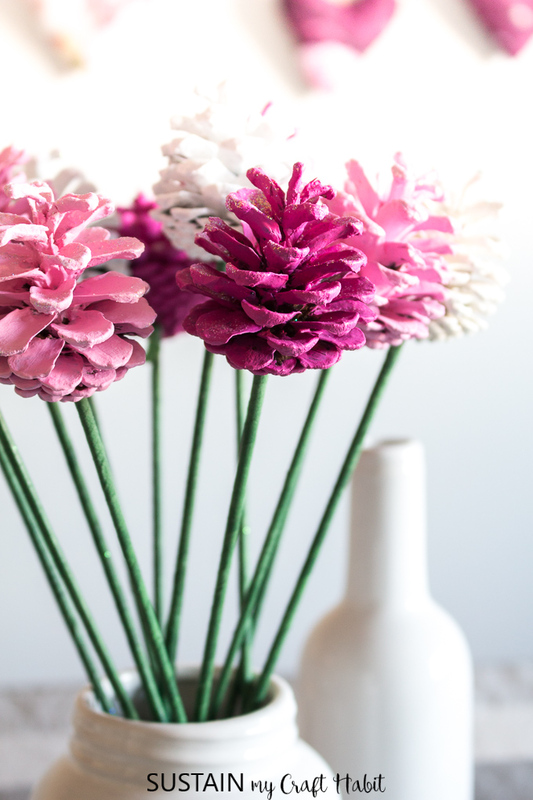 I love having flowers around my home all year round, and these are the perfect solution! Totally! 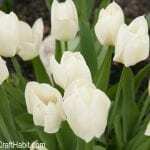 I’m going to enjoy seeing these in a vase all year round. This is such a cute idea! My girls would love to make these with me, too! We don’t normally craft with variations of pink so it was a real treat for us! This is soooo cute! Love the pinecones. So creative! Thank you so much, Adriana. Glad you like them. You guys are so clever, what a sweet idea! Oh, that little touch of glitter – so smart, good call! Can’t wait to make these with my kiddos. We couldn’t resist the glitter! So cute!!!!!! These would make for a great classroom craft!!! 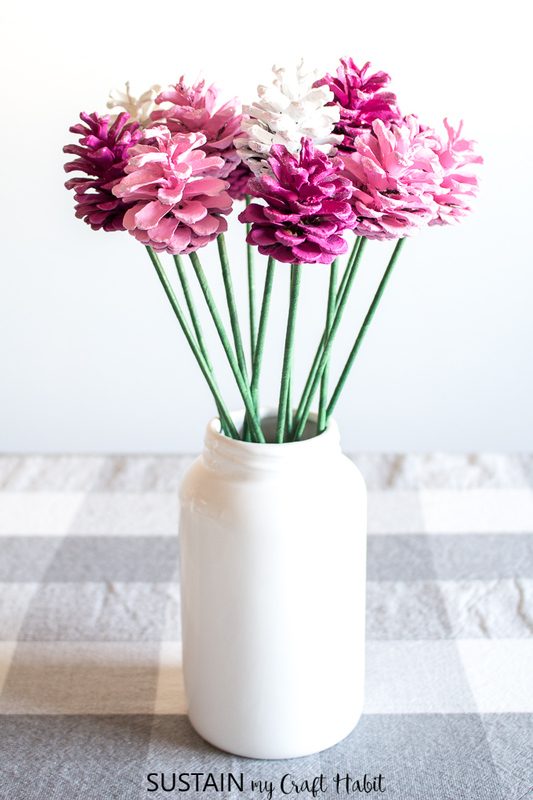 The kid’s could make these for Mother’s Day. Would just need to predrill the pinecones for the kids beforehand. What a great idea and I love the colours you used too! So cute.